A North Korean soldier killed two of his officers Saturday and defected to South Korea across the countries' heavily armed border in a rare crossing that prompted South Korean troops to immediately beef up their border patrol, officials said. 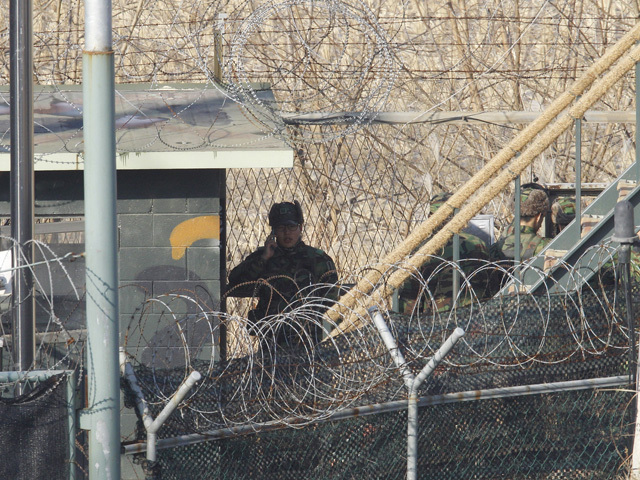 The soldier shot his platoon and company commanders before crossing the western side of the Demilitarized Zone at around noon, a Defense Ministry official said, citing the soldier's statement after he was taken into custody by South Korean border guards. The official declined to be named because questioning by authorities was ongoing. He said the soldier used a loudspeaker to let South Korean border guards know his intention to defect after the killings. The official said the motive behind the defection was unclear. Border security has been tighter than usual along the border in the past few years as military and political tensions between the rival Koreas soared. In 2010, a South Korean naval ship sank and 46 of its sailors died in an incident blamed on North Korea, though Pyongyang denies involvement. Later that year, North Korea bombarded a South Korean front-line island, killing two marines and two civilians.